BetVictor have always given off a lot of energy, with their quirky advertising campaigns and charismatic leader, Victor Chandler, giving the brand a customer facing reputation and keeping the business feeling human. Chandler himself is a bit of a trail blazer in many ways, being one of the first bookmakers to take his business online, as well as leading the charge to Gibraltar where the company is based, and where many others soon followed. It would be fair to say that the Sportsbook gets more love and attention than the Casino side of the operation, yet the Casino offering still manages to put many of its competitors to shame. Over 500 slots are waiting to be played, from old classics to exciting new offerings from industry stalwarts and a few hungry new developers too. The Live Casino is powered by Evolution Gaming and is pretty meaty, especially good for Blackjack fans, but Poker players may feel somewhat disregarded since BetVictor ceased Poker operations in 2017 due to poor take up. Still, the company manages to pull in 500,000 players globally and turns over more than £1 billion annually, so they probably don’t need to start worrying any time soon. Deposit (debit/credit card only) and play £10+ (except for Baccarat and “Blood Suckers” slot) in 7 days. Get £50 bonus package split into one £20 bonus for slots (35x rollover), £10 live casino and £10 table game bonuses (60x each) and a £10 instant win bonus (35x). All valid 3 days (game restrictions apply). No maximum payout limit for bonus. Entering the Casino, a classic simple design gives a polished effect that is easy on the eye and feels like a professional environment in which to play. The interface ties in well by not bombarding players with options, instead laying out a clear menu to break up the slate of games with a few options to whittle down the selection further once you have chosen your category. For instance, if you choose Slots you can then filter by Provider, Newest, Most Played and Favourites. Although there is a search bar, we would have been grateful for a few more options here so as not to be faced with a screen of 100s of slots, but actually, the reduced size of the game tiles makes the choice easier to take in and process. We can’t fault the mechanics; the site is responsive and graphics load gently in a silky manner – there is actually something of the gentleman’s club about the interface which we really enjoy. A whisky and brandy type of gentleman’s club, though, not a dances and fluffy handcuffs one. The game library is fast approaching 550 in number, and Microgaming are fighting with NYX for the top spot, with 112 and 137 titles respectively. NetEnt, Gameiom (Pragmatic Play), IGT, Play’N Go, Quickspin and a few others have a pretty even spread of the rest. These are all instant play, and since BetVictor have Liverpool FC as a principal partner there are some LFC specific games thrown in for good measure. Slots – A few exciting new slots are Clock Work Mice and Robin of Sherwood, but the ever-popular Starburst and Gonzo’s Quest also make an appearance. We could lose you for days exploring the rest. Jackpots – There are 16 in total, and with some like Mega Moolah seeding at £1 million you know you are in for quite a ride. Live Casino – However deep your pockets do or don’t go, you will be satisfied by one of the 50 games in the Live Casino. A huge Blackjack selection, 9 Roulette rooms, 5 Baccarat tables, and 3 Poker offerings await. Blackjack – Getting a special mention is Blackjack with a stonking 33 variations in the Live Casino and a further 5 in Table Games, from Blackjack Pairs to Blackjack Party. Table Games – Limited to only 11 games, but nevertheless, a good mix of Roulette, Blackjack and a single Baccarat offering. 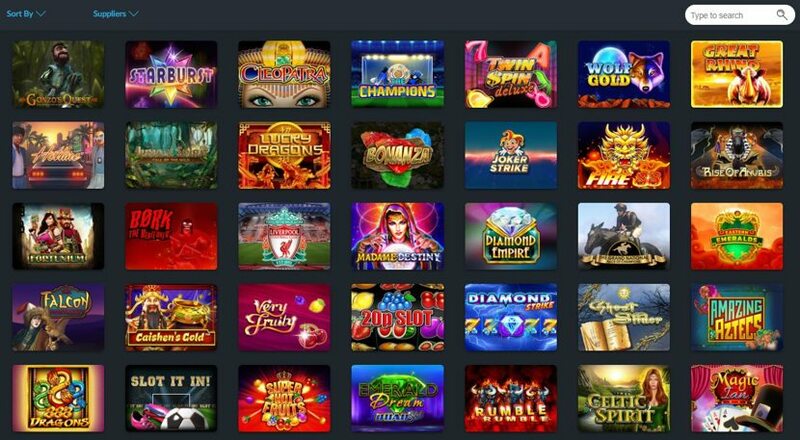 Video Poker – Since BetVictor closed the doors of its Poker operation in 2017, one of these 8 games are your next best option. Try All American Poker for that authentic feel. Instant Win – There are 32 titles here that get straight to the point. Sports fans could try Red Card or Golden Boot 2018, otherwise Rainbow Magic or Epic Gems could be for you. 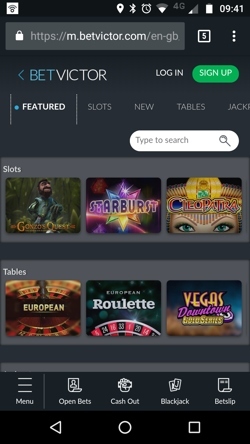 BetVictor could hardly call themselves a top flight Casino if they didn’t offer mobile gaming, so they not only developed a mobile optimised website, but they created an app as well which, commendably, was developed in house. They are both instantly recognisable as BetVictor products, although they differ from each other slightly in design. The app feels cleaner and smoother than the mobile site, the arrangement of the game tiles is more satisfying to look at and they seem to load with less effort. The mobile site isn’t far behind though, and has the benefit of retaining some of the filtering options from the desktop site that didn’t make it onto the app. Both are beautiful to look at and use, with Live Chat and the ability to jump across to the Sports Book easily available. Around 300 of the games have made the transition to mobile which is plenty to be getting on with, some are available in free play too, and loading times are acceptable. Negatives, if you can call them that, would be that it they are both geared more towards the Sports Book, although that doesn’t get in the way, and the app crashed on us once when we tried to do a few other things at the same time… my Mum called alright, she worries about me. 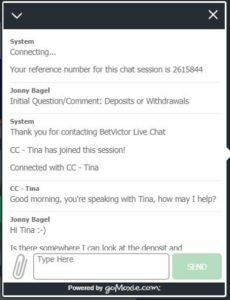 Low minimums on withdrawals and deposits, unlimited withdrawal maximums via BACS, plus the use of Paypal are a credit to BetVictor, and there are plenty of other options if you aren’t a Paypal fan as well. There doesn’t seem to be a good reason for the unusually long processing time when withdrawing using an E-wallet, but they may just be covering their backs by stating a potentially longer wait. Your specific allowances will vary depending on your location and status at the casino, but for the most part if you are UK based, the table below will serve you well as a guide. Withdrawal maximums are shown per day. BetVictor has existed, in one form or another, since 1946, when William Chandler ran the Walthamstow Greyhound Stadium. Once gambling in the UK was legalised Chandler was quick to react, setting up their first bricks and mortar betting shop in 1963. William’s son, Victor (not that Victor), took over the running of the business soon after, and in a moment of ego the Victor Chandler brand was born. Victor passed both his self-admiration and his name down to his son, Victor, before tragically passing away in 1974, ultimately passing on the company as well. Victor Chandler Jnr was only in his mid-20s when he became chairman of the family business. Victor Snr had nothing on Victor Jnr when it came to charisma and self-confidence, and since he took the reigns – eventually rebranding to the BetVictor name we know today – Chandler has been active in all areas of the business, from starring in TV campaigns to helping the customer service team on the phones. A hugely likeable man that made bold choices and left an impression wherever he went. The late 90s saw the company move online, one of the first of its kind to do so, and the turn of the millennium saw the addition of the online Casino. 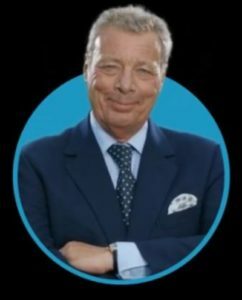 Another shrewd move from Chandler saw him shift the company offshore to avoid UK Gambling Tax, with competitors taking his lead soon after; it has even been suggested that this was the reason that Gordon Brown abolished the Gambling Tax in 2001. After 40 years of running one of the most successful bookies in the world, pioneering the industry and indirectly influencing political decisions, Chandler stepped aside in 2014 and handed the business over to Michael Tabor: for the first time since its foundation the company was no longer in the hands of the Chandler family. It’s always nice when a Casino makes it easy for players to reach them, it feels welcoming and shows that they take their responsibilities seriously. Well Bet Victor’s customer service centre is open 24/7 and is available anytime, so you are well taken care of there. Our experience using Live Chat was smooth and rapid, we were connected to an operator almost immediately and she was friendly and quick to respond. This experience may vary depending on who you get though, as the second person we spoke to was much less helpful. Reports on e-mail response times are good too. The searchable Help Centre is BetVictor’s take on an FAQ. It’s a little frustrating in truth as you need to search quite specific terms to get what you want, so there is room for improvement here; but with so many other help options available to you it shouldn’t hold you back. Live Chat – Always available via the expanding speech bubble icon at the bottom of each page. Telephone – You can request a call back but their number isn’t listed. Go to Contact Us in tiny writing at the bottom of each page. @BetVictor – This is their most active account, although it focuses almost entirely on Sports.